Our goal is to give you exceptional service and value that goes beyond your expectations. Our committed sales and service staff have many years of experience satisfying our customers’ needs. We are here to answer any questions you may have. From auto financing solutions to new and used cars for sale, and auto repair to car parts, you can be sure to find what you are looking for at Gerald Nissan! 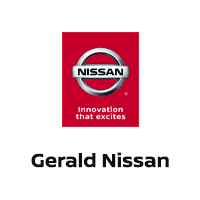 Thank you for visiting Gerald Nissan! We have two locations in North Aurora, IL, and Naperville, IL, and proudly serve the surrounding areas of Aurora, Wheaton, Bolingbrook, DeKalb, St. Charles, Oswego, as well as the greater Chicagoland area. The Gerald family of dealerships take great pride in providing a lifetime commitment to their customers. At Gerald Nissan, that commitment to superior service begins when you set foot in one of our convenient locations. We strive to create authentic and trusting relationships with our customers, so you can feel assured that when you purchase a new or pre-owned car from us, you not only have a reliable vehicle but a lifetime commitment to excellent service from all of us at Gerald Nissan.